Wilderness hut in Utsjoki, Finland. 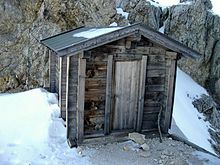 A wilderness hut, backcountry hut, or backcountry shelter is a rent-free, simple shelter or hut for temporary accommodation, usually located in wilderness areas, national parks and along backpacking and hiking routes. They are found in many parts of the world, such as Finland, Sweden, Norway, and northern Russia, Australia, New Zealand, Canada, and the United States. Huts range from being basic and unmanned, without running water, to furnished and permanently attended. Remote huts sometimes contain emergency food supplies. 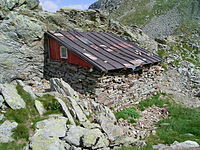 Similar shelters can also be found in remote areas of the Alps (known in German as Biwakschachtel). In order to complete some tours, it is necessary to spend the night in such shelters. 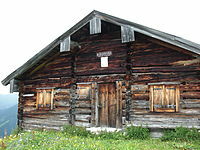 Even though Biwakschachteln are also tended to by the Alpine Clubs, they differ markedly from the more accessible mountain huts, which are actual houses suitable for permanent use. Unlike mountain huts, they do not have a permanent resident who tends to the building and sells food to mountaineers. In general, these huts do not have regular maintenance schedules nor paid maintenance staff. Unofficial rules for use have arisen. Visitors are expected to leave the hut as they would like to find it. Fires should never be left unattended, and if the firewood supply is used up, the visitors should replace it. Some areas are designated fuel stove only, because cooking on a fuel stove can reduce the use of firewood. Some huts contain emergency food stores like canned food and bottled water, meant to consumed in urgent situations. Often no toilet facilities are present, and the general rule requires that toilet waste should be buried away from the nearest watercourse or the hut. Generally no running water is available in the huts. It is often recommended when using water from a stream, that the water should be boiled for at least five minutes because of the potential danger of gastroenteritis and giardia. Detergents, toothpaste and soap (even biodegradable types) can harm aquatic life, and waterways are easily damaged. When leaving the hut, visitors are generally expected to leave it clean and secure, with the fire out, and the doors and windows securely closed. Escaping fires can severely damage the environment. Rubbish should not be buried. Rubbish like cans, plastic bottles or broken glass are often dug out by native animals and may harm them. All waste should be disposed of by taking it away for proper disposal. Rules can differ between Europe, Australia and US. Moscow Villa in Victoria, Australia. The Oahujoki wilderness hut in Lemmenjoki National Park, can accommodate seven people overnight. Official wilderness huts are mostly maintained by Metsähallitus (Finnish for Administration of Forests), the Finnish state-owned forest management company. Most of the wilderness huts in Finland are situated in the northern and eastern parts of the country. 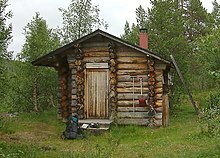 Their size can vary greatly: the Lahtinen cottage in the Muotkatunturi Wilderness Area can barely hold two people, whereas the Luirojärvi cottage in the Urho Kekkonen National Park can hold as many as 16. 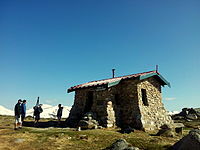 A wilderness hut need not be reserved beforehand, and they are open for everyone tracking by foot, ski or similar means. Commercial stays overnight are prohibited in the wilderness huts owned by Metsähallitus. Unofficial and unmaintained huts also exist. For centuries the vast wildernesses of Finland and its resources were divided amongst the Finnish agricultural societies (such as families, villages, parishes, and provinces) for the purpose of collecting resources. Areas divided in this way were called erämaa, literally "portion-land," (now literally the word for "wilderness" in modern Finnish). People from agricultural societies made trips to their erämaas in the summer, mainly to trap animals for fur but also to hunt game, fish, and collect taxes from the local hunter-fisher population. Huts were built in the wilderness for use as base camps for hunters and fishermen. Also non-agricultural Sami people built huts to help them manage reindeer. The earliest huts were only allowed to be used by people from the communities that owned them. Outsiders were not allowed to use the resources of other communities' erämaas. Huts that were free for everyone were first seen in late 18th century Finland, when dwelling places were built along walking routes for passers-by. In the 19th century the authorities started building these huts. Later in the 20th century they started to be built for travellers. New Zealand has a network of approximately 950 backcountry huts. 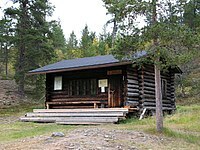 The huts are officially maintained by the Department of Conservation (DOC), although some of the huts have been adopted and maintained by local hiking and hunting clubs by arrangement. There are also unofficial and privately owned huts in some places. They vary from small bivouac shelters made of wood to large modern huts that can sleep up to 40 people, with separate cooking areas, utilities and gas. Some huts were initially commissioned or built by clubs along commonly walked routes, both for safety reasons as appropriate, and sometimes for convenience. The network of back-country huts in New Zealand was largely extended in the mid-20th-century, when many more were built to serve the deer cullers of the New Zealand Forest Service. Most larger and more modern huts, like some found on the Great Walks, have been purpose designed and built to serve trampers. Many of New Zealand's back-country huts are remote and rarely visited, and it is common for recreational trampers to design trips with the idea of reaching and visiting specific huts. Some people actively keep count of which huts they have visited, a practice which is informally referred to as hut bagging. Back-country huts in New Zealand were free to use until the early 1990s, when the New Zealand Department of Conservation began charging for their use. For most back-country huts, nightly hut tickets are purchased via an honesty system by people who use the huts, with an additional option of purchasing an annual pass for people who use huts frequently. Huts on frequently used and heavily marketed tracks, such as the New Zealand Great Walks, usually operate on a booking system, and often have resident wardens checking the bookings of users who arrive to stay the night. Since the inception of hut fees in New Zealand, there has been controversy amongst some hut users. Many users belong to clubs which helped to build and maintain the huts before the government department was created, and consequently inherited them. It is common to find people who refuse to pay for the use of huts in protest, arguing that the government is trying to charge them to use facilities that they themselves are entirely responsible for providing. DOC argues that all hut fees are used for the continued maintenance of huts, and for building new huts as appropriate. It has at times made efforts to demonstrate this by specifically allocating money from hut fees towards budgets for these purposes. The majority of the huts were built in an era of lower levels of government regulation and the long term use of the huts was not considered. As a result of the Cave Creek disaster in 1995, DOC tightened up on the standards for structures on public land. Some of the huts were upgraded to meet build regulations whilst others were removed or had certain facilities (such as beds) removed to cause them to fall into less strict building categories. In 2008, because of the recognition of the unique situation and the remote locations, the government relaxed the building standards for the huts. They now no longer need to have emergency lighting, smoke alarms, wheelchair access, potable water supplies or artificial lighting. 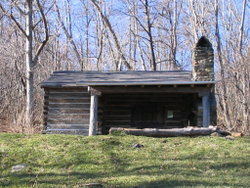 The Pocosin cabin along the Appalachian Trail in Shenandoah National Park. In the United States, backcountry huts may be provided by the Forest Service, state or national parks such as the Great Smoky Mountains National Park. 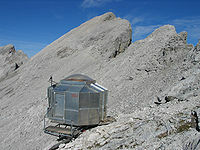 Wilderness huts are frequently located along hiking routes. The Tenth Mountain Huts is a system of 29 backcountry huts in the Colorado Rocky Mountains honoring the men of 10th Mountain Division of the US Army, who trained during World War II at Camp Hale in central Colorado. They provide a unique opportunity for backcountry skiing, mountain biking, or hiking while staying in safe, comfortable shelter. ^ a b "Backcountry hut information: Places to stay". Department of Conservation. Retrieved 4 February 2013. ^ "Historic Te Totara Hut: Te Urewera". Department of Conservation. Retrieved 4 February 2013. ^ "Building rule changes reduce red tape for huts". New Zealand Government. 2008-10-31. Retrieved 2008-10-31. Part of this article is based on a translation of an article in the Finnish Wikipedia. Barnett, Shaun; Brown, Rob; Spearpoint, Geoff (2012). Shelter from the storm: the story of New Zealand's backcountry huts. Nelson, New Zealand: Craig Potton Publishing. ISBN 9781877517709. Laaksonen, Jouni. "Autiotuvat on-line" (in Finnish). Retrieved 2006-06-05.